IRISH budget airline, Ryanair, has claimed that they, other airlines and a London airport are being discriminated against by NATS, the air traffic control provider in the UK, that is owned by rival airlines. To back up their shocking allegation the airline has released data published by the UK’s Civil Aviation Authority which, they say, confirms that Ryanair and other London Stansted Airport airlines are being discriminated against by NATS. They claim that London Heathrow is being given special treatment, and Gatwick is also being preferred. Ryanair say that London Stansted Airport suffered 52% of all air traffic control delays in the London area from January – March 2018 caused by NATS, while Heathrow (which has three times the traffic) had 0 per cent of NATS delays and Gatwick just 10 per cent. The low-cost says, “The failure of NATS to fairly supply ATC staffing and airspace resources at Stansted Airport has wreaked havoc this summer on both Ryanair and London Stansted flight schedules, with 2018 shaping up to be the worst year on record for ATC disruptions at Stansted. Ryanair’s COO, Peter Bellew said, “Ryanair and Stansted are clearly being discriminated against by the UK airline owned ATC provider NATS. That Stansted has had 52% of all NATS delays in Q1 while Heathrow has 0% (and Gatwick just 10%) is unjustifiable. These disruptions are unfair and unacceptable, and we call on the UK Dept of Transport and the EU Commission to take urgent action to ensure that the UK ATC provider (NATS) is fully staffed and treats each London airport fairly. NATS don’t have enough staff. “Ryanair is today submitting a formal complaint to the European Commission and the UK CAA over this blatant discrimination against Stansted Airport and Ryanair. A year ago Ryanair issued a similar complaint against NATS to the CAA. The investigation concluded that while there were no sign of discrimination, the ATC provider would be under increased scrutiny. A London Stansted Airport spokesperson said, “Good on-time flight performance is a key priority for London Stansted and our customers, and we work closely with others in the industry to deliver the best possible service. NATS has an important role to play in ensuring a level playing field between competing airports in how it manages airspace. 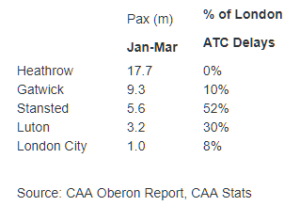 “The CAA’s Oberon report highlights a number of issues that merit further investigation, particularly the evidence that suggests that Stansted experienced a disproportionate share of ATC delays in the London area. A spokesperson for NATS told The Telegraph, “Ryanair performance this summer cannot be blamed on UK air traffic control. “The figures Ryanair quote from earlier this year coincide with the introduction of new technology that affected the number of flights in and out of Stansted during that period. “Luton Airport was similarly affected at that time and other airports were affected at other times over a six month period. All airlines and airports were notified of the timetable in advance and understood the new technology will help us increase capacity safely in the future. “NATS has a duty to ensure commercial aircraft can fly safely through UK airspace. Adding extra controllers to the Essex airspace will not make a difference. Pay the money and get extra staff to avoid the delays instead of just moaning and not contributing.